Hanson JO, Schuster R, Morrell N, Strimas-Mackey M, Watts ME, Arcese P, Bennett J, Possingham HP (2019). prioritizr: Systematic Conservation Prioritization in R. R package version 4.0.4. Available at https://github.com/prioritizr/prioritizr. We will use the sim_pu_polygons object to represent our planning units. Although the prioritizr R can support many different types of planning unit data, here our planning units are represented as polygons in a spatial vector format (i.e. SpatialPolygonsDataFrame). Each polygon represents a different planning unit and we have 90 planning units in total. 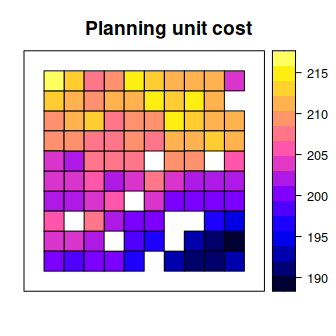 The attribute table associated with this data set contains information describing the acquisition cost of each planning (“cost” column), and a value indicating if the unit is already located in protected area (“locked_in” column). Let’s explore the planning unit data. Let’s say that we want to develop a reserve network that will secure 20 % of the distribution for each feature in the study area for minimal cost. In this planning scenario, we can either purchase all of the land inside a given planning unit, or none of the land inside a given planning unit. Thus we will create a new problem that will use a minimum set objective (add_min_set_objective), with relative targets of 20 % (add_relative_targets), and binary decisions (add_binary_decisions). Please refer to the package website for more information on the prioritizr R package. This website contains a comprehensive tutorial on systematic conservation planning using the package, instructions for installing the Gurobi software suite to solve large-scale and complex conservation planning problems, a tutorial on building and solving problems that contain multiple management zones, and two worked examples involving real-world data in Tasmania, Australia and Salt Spring Island, Canada. Additionally, check out the teaching repository for seminar slides and workshop materials. If you have any questions about using the prioritizr R package or suggestions from improving it, please file an issue at the package’s online code repository.